The ultimate lines to use with bamboo rods are silk lines. Terenzio, a craftsman from Rome has been manufacturing silk lines for decades. He produces the finest natural silk lines that are available on the market. 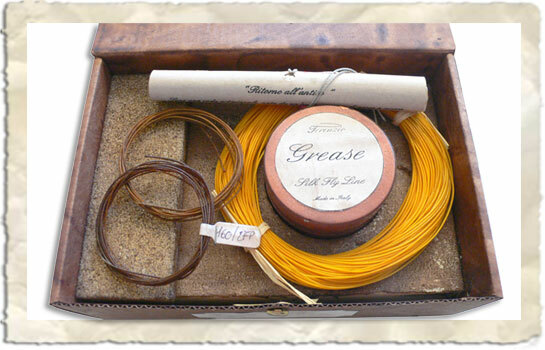 Terenzio strives for perfection and is constantly studing new tapers to suit the modern fisherman's requirements. So if it's a DT, a WF or Arrow Taper WF lines, Terenzio is your man! Weights available: from a #1 to whatever line weight you need. An added feature is that you can order intermediate weights for example your bamboo rod my struggle with a 3 weight and be overloaded with a 4 weight. Terenzio's half weights are perfect for this. Terenzio's lines are low maintenance. They float like corks and last forever!